2. Brush a shallow ovenproof dish with melted butter or oil, line with lasagne sheets – breaking them to fill any gaps. Set aside. 3. To make cheese sauce, melt butter in a medium pan. Add flour and sit for one minute. Remove from heat. Gradually add milk, stirring until mixture is smooth. Return to heat. 4. Cook, stirring constantly, over medium heat until sauce boils and thickens. Reduce heat, simmer for three minutes. Remove from heat, add cheese, salt and pepper. Stir well until combined and set aside. 5. To make meat sauce, heat oil in a large pan. Add onion and garlic and stir over low heat until onion is tender. Add mince. Brown well – breaking up with a fork as it cooks. Stir in undrained, crushed tomatoes, wine, oregano, basil, salt and pepper. Bring to boil. 6. Reduce heat, simmer 20 minutes. 7. Spoon one-third of the meat sauce over lasagne sheets. Top with one-third of the cheese sauce. 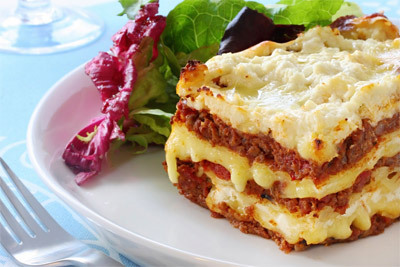 Arrange a layer of lasagne sheets on top. 8. Continue layering, finishing with lasagne sheets. Sprinkle with combined mozzarella and cheddar cheese. 9. Pour cream over the top. Sprinkle with parmesan. 10. Bake for 35-40 minutes or until bubbling and golden.